Stylishly designed with eye-catching page layouts and beautiful images, this history of the""the wasp"" will delight any Vespa aficionado. The late Roberto Segoni, professor of industrial design at Florence University, sets the production in line with an introduction that celebrates Italy's post-WWII design history and situates the Vespa alongside such achievements at the Olivetti typewriter and the Arco lamp. The rest of the book traces the evolution of the motorbike's signature C-shaped seat, its engine and its worldwide popularity, providing a detailed catalog of Vespas from the first 1946 model to the present. (The book also includes four short essays on Vespas, one of them by New Yorker correspondent Bill Buford.) Early black and white factory photos, flashy color ads and stills from films and commercials break up the text and turn this book into fun coffee-table history. 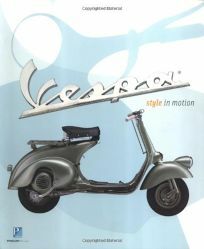 Now that Vespas can be legally imported into the U.S., the number of American Vespa fans is growing, and this volume is clearly formulated to charm them. 1,000+ illustrations.